For many people a very simple phone set up at the cheapest possible price is what they are looking for. At under $30 you really cannot get much cheaper for a cordless home phone system with two handsets. In this VTech CS6419-2 review you will find out what the features are for this phone, and whether these will be enough for your needs. This is essentially the international standard used for cordless phones. It specifies the wireless technology, and by adapting this standard phones will have a certain quality in their communications. While the quality of range will depend as much on environmental factors, it is probably very rare that you will find the limits of the range. Audio quality is incredibly good and the technology also has built in encryption that is very difficult to interfere with. The handsets for the CS6419 come with built in speakerphone. This means that you can use the phones hands free while you are tending to other stuff around the house. This is especially convenient if you have very young children, as you can tend to their needs and still have a conversation. However, you should be aware that this will not give you a lot of privacy, and the handsets do not come with a headset jack. 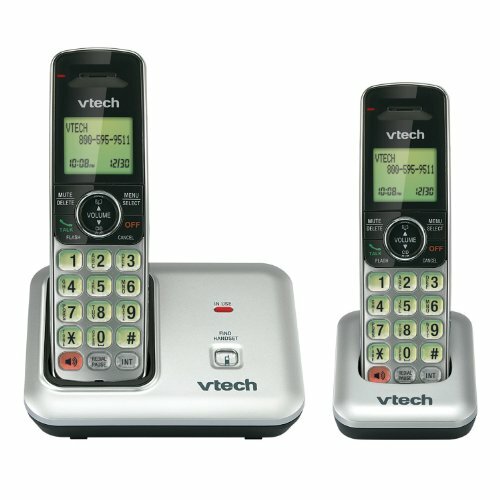 The talk time on this VTech phone is on the low side when compared to other models reviewed on this site. But if you do not use the phone a huge amount then 7 hours of talk time can be quite adequate. It is advisable though to put the handsets in the charging units very regularly, as you can be caught out by low batteries. This part is probably one of the more negative parts of this VTech CS6419 review. This particular set comes with two handsets, but you can expand it up to 5 in total. This is really handy if you have an expanding household with children that will eventually get to a stage where they spend all day on the phone to friends. You can simply purchase an additional handset separately and add it to you home phone system. The phone book will store up to 50 numbers, which is pretty good. With multiple handsets in the home you could give each household member a phone and they can then store their own numbers in their designated device. You do not need to store the same numbers in all handsets. Overall this VTech CS6419 review is positive considering the price of this model. As you can see above, functionality is quite limited which may well suit many people. Considering though that for about $30 more you can get an answering machine, much better talk time and a headset jack, it may be a good idea to go one step up the ladder.